Torn from a life of comfort and luxury, his family destroyed by political intrigues and aspirations, a young boy must quickly grow into a man before the deadly streets of Southport devour him. Follow Azerick through a non-stop adventure that pits him against thieves, thugs, murderers, and men of power that will stop at nothing to achieve their goals. Azerick must fight just to survive, but for him survival is not enough. A hunger to avenge the wrongs committed against him burns deep within. But that is not all that lies within the young man. There is a power waiting to be unleashed that may be the key to achieving the justice and security he seeks...if it does not destroy him first. Where do you go when you have no one left? Azerick is a great character. I'm going to get that out there first and foremost. Secondly, this is an amazing series, one that I have come into a bit backwards. I read book two first, and loved it. Loved it enough that I had to see where Azerick had come from, what he really endured, what made him into the man he was in book two, and I am glad that I did. 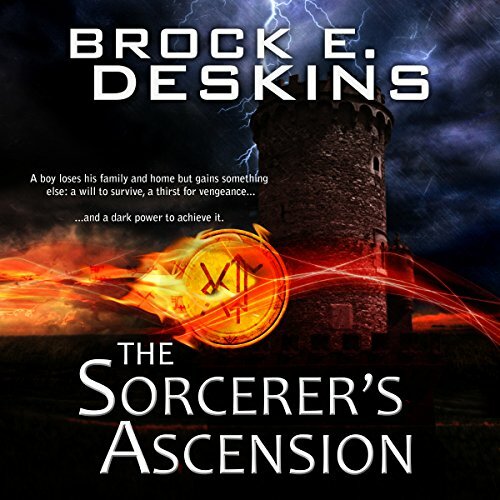 The sorcerer's ascension might give away a bit of a clue, as we find Azerick moving from one "home" to another until he goes to a wizarding school. He does great in some areas, but in others he is lacking. The title is the key. I won't give anything away, but I have to say that once he gets on track, Azerick becomes a foce to be reckoned with. There are a couple of folks who get on the man's list including a Duke, a school jerk, and innkeeper, and the Thieves Guild in general. And Azerick, like a Lannister, always pays his debts. He never forgets or forgives. I first read Brock Deskins' book, the Miscreant, and was amazed at howwell he crafted his characters. After all, the lead in that book is a sociopath, and you still love to see what he's up to. In the Sorcerer's Ascension, he really crafts some incredible and realistic characters. Not matter the villainy of the Duke or Travis the are real peopl, not mushtache twirling caricatures. Azerick, himself is more human than a lot of characters I've read. I kept thinking that he was so real he was going to come out of the book like in the movie Purple Rose of Cairo. So, he has good characters, what about the story you ask? Well, lemme tell ya the story is interesting, heartbreaking, and exciting. The action and oppression sweep you in, and the story is so comelling that you will not want to stop. Turbett is amazing as the narrator, and he brings each character to vivid life, his voices seem natural, and he fills their words with real emotion. Book 2 is just as good, and I really suggest that you get this series, as it is a true blast, real fun, and honest excitment. (Disocunting all of Azerick's misery, of course!) Even though I did receive a promo code for this review it in no way influenced my considerations of the material, and in fact, inspired me to be more honest. In fact, getting a code generally makes me harsher as a reviewer as I am more often concerned what someone like Me will decide based on my review. Azerick's father is given an artifact from the king, to transport on his ship. But when he docks, he is accused of treason because the letter from the king evaporated when it was touched by the Guards. Locked up with no hope of freedom, he seems to be the unwitting accomplice to something larger. When he is murdered in his cell, with all evidence being that it was a mage, his families world is turned upside down. Thrown onto the streets with little to no possessions, Azerick and his mum struggle to survive. His mum finally finds a job in a local tavern and they try to settle down. But life isn't done with Azerick yet and his mum is murdered. Alone on the streets, he finds himself battling to stay alive. He also finds a deep thirst for revenge that won't be quelled. Revenge on the people who killed both his parents and revenge on anyone who has done him wrong. Becoming a thief is the only way he knows how to survive, and he becomes very efficient at it, but pick pocketing the wrong person turns his life upside down again! This has so much more happening throughout the book, that you just know there is a lot more to come! Not only do we have Azericks story, we also have a king who wants to get magical armour before his enemies can, we have a political coup trying to take seed and we have magicians and sorcerers as well. There is a lot of depth to the plot and this seems to only be the tip of the iceberg. I'm really looking forward to seeing where the author takes the story next!! I must admit that it took a while for me to totally connect with Azerick. I found his determination for revenge and the way he was almost heartless at times a little unnerving, but as the story progressed I got a better sense of who he was and it made me warm towards him more. I started to really like him once he went to the magic school. He was a better character then. This started slow and took a long while to really get going, but even the slow part was devoted to Azerick and his life now, and was very much needed in order to fully understand the character. Other than that, this was a really enjoyable and entertaining story. I'm excited to see what happens next. William Turbett read this really well. He had enough tones and voices to differentiate most of the characters and he was easy to listen to. I did find though that a few of his characters sounded too similar to fully follow who was who. I was given this free audiobook at my request and have voluntarily left this review. This in no way affected nor influenced my thoughts. Liked the story. Wasn't fond of the narrator. Good story that I found to be engaging and kept me interested. Good characters that grew and developed over time. This is a fun story that i would recommend. My only problem was the occasional mispronounced words by the narrator. They weren't often, but there were a few of them and each time they really distracted me from the book. I was given this free review copy audiobook and have voluntarily left this review. Fantastic start to a dark fantasy series! I went into this one without any preconceptions, other than knowing I had enjoyed the author's urban fantasy novel Shroud of Darkness. I found that though this is a completely different book, it was just as enjoyable. After reading this, I felt that this was what The Name of the Wind should have been if the main character wasn't a complete Mary Sue. When Azerick, son of a wealthy sea trader, has his father executed after he was framed for treason, He and his mother lose everything to the local Duke. They end up living in an inn his mother works at as a server. When she is violently murdered and he is thrown out, Azerick returns after dark, breaks in gets his stuff back, and after struggling with and incapacitating the innkeeper who stole their belongings, burns the inn to the ground. This sets Azerick on a path he could never have foreseen. Squatting in an abandoned building, he is found by a group of squatters and joins their ranks. When a dispute with the thieves guild destroys his new family, Azerick declares war on the thieves, getting his revenge in the cruelest way possible. After a series of run ins with the Mages guild, it is discovered Azerick has magical ability and he is allowed to start training at the guild academy, where the children of rich and noble scions train. Obviously, as a poor orphan, he butts heads with the other students, especially the biggest bully boy, Travis. As you can expect, a boy used to living by his wits and strength on the street is not going to take bullying lying down. This theme continues throughout the book, as Azerick, who is very smart and understands magic theory very well, struggles to cast spells beyond a certain simple level, although he does excel in academic subjects and alchemy. This changes when it is discovered that Azerick is a sorcerer, not a wizard, meaning his spell casting is self determined, not cast by rote spells. With this revelation, and a new master to tutor him, his spell casting is greatly improved. As time passes, and his rivalry with Travis reaches its final climax in a duel, Azerick discovers a secret that may effect the safety of the world, and he must determine what he needs to do and where his loyalties lie. This ties into a side plot dealing with the kingdoms founding as it's dragon overlords were overthrown with the help of five suits of magic armor that are now in play in a power play for the throne. The characters are a real strength of this book, especially Azerick. His struggles after his families fall and subsequent successes and failures really tempered his personality. He is a hard young man, willing to take the harshest measures for revenge and to protect those he loves. What he did to the man who killed his mother and to the thieves guild show that no measure is too radical to achieve his goals, for good or ill. The secondary characters, from his best friend to his mentor are well thought out and have well rounded personalities. The villains, whether Travis or the Duke and his henchmen, are loathsome but believable, being drawn to power and the ability to abuse it. The setting is well thought out and well described, with lots of detail without going overboard. The plot and prose flow well, with lots of action, but some introspection as well, as the events unfold to show the grander conspiracy and how it connects to Azerick.The final portion of the book is like a roller coaster ride leading to Azerick and Travis's inevitable confrontation, and has a satisfying payoff. All told, a dark but enjoyable beginning to a series. I was unfamiliar with William Turbett's narration before this book, but I am happy to have discovered him. He brings each character a unique life of their own, with a variety of tones and accents, and his pacing is very solid. He makes you want to keep listening as he brings the story to life. I have heard that this book was compared to The Name of the Wind in a negative way. I find that odd, since while it deals with similar characters, it goes in very different directions, with the characters having different methods and motivations. I would recommend this story to anyone who would like a different take, a darker one, on a coming of age tale, with well rounded characters and real struggle and pathos. Would you consider the audio edition of The Sorcerer's Ascension to be better than the print version? I can't say which is better, audio or written, it's mostly up to your preferences. But I do recommend this version if you really like the series. The character Azerick is a very interesting character. We see him fall from a comfortable life to a life on the streets trying to survive, to eventually being something maybe even darker. I want to see how he progresses throughout the series. The moment where Azerick deals with the intruders in his home, and finally making a deal with the entity known as Sharellan. Having listened to another book by the author that I enjoyed, I had high hopes for this novel. Unfortunately I didn't feel that this was as strong as Shrouds of Darkness. The title was a bit misleading as the whole concept of sorcery doesn't come up until the very end of the book. This is one of the few books where I found it difficult to multitask while listening, because the narrator seemed to be rushing through all the text. I tried to slow it down on my iPod but the voice became too distorted. It made it hard to focuses on the story. He also mispronounced a few words, the tonality was sometimes off, and at times I could hear a slight echo suggesting that he wasn't in a sound proof room while recording. This story didn't start for me until 7 hours into the recording. When he goes to school and starts learning about magic, I was intrigued and wanted to learn more. Until then, it felt like one of any number of other fantasy novels featuring an orphan surviving on the streets. Up until the protagonist goes to school, I felt like it was kind of a bait and switch story given the title. You'd expect a magic heavy book about a protagonist learning about magic things. That's not this novel. This also could have benefited from a few more editing passes, to add more contractions to make the dialogue sound more natural. I really wish the last third of the book was stretched out into at least double its length, and everything before that was compressed. With that, and the editing of dialogue, this could have been a solid 4* novel. As it is, I could take it or leave it. Wow, what an excellent tale! I received this audio book for free in exchange for my honest review. The writing and narration both combine smoothly in this magical tale. This ranks up there in the top of the list of fantasy books I've had the pleasure of enjoying. Azerick is my new favorite character of 2018. Azerick loses everything in his life and is forced to learn to live on the street as well as master magic in order to survive. The characters in this book are extremely strong and entertaining both. They are simultaneously realistic as well as working for a fantasy setting. The villains are also well-done with their motivations being realistic and avoiding mustache-twirling villainy while also being hateable. His backstory and the execution of his father reminded me a bit of Assassins Creed 2 with Ezio Auditore. The rest of the book reminded me a bit of The Name of the Wind but I like a great deal more than Kvothe. The story is engaging from beginning to end and I'm very glad to have listened to it in audiobook form since I enjoyed William Turbett's narration a great deal. He brings life to the protagonist's journey and handles the secondary voices just as well. This book almost felt a bit like a series of openings to a number of other books, before you reach the point of him becoming the titular sorcerer you had a young boy named Azerick from a reasonably privileged background finding himself on the streets after his father was wrongly implicated in a crime, from there he becomes a fairly successful thief before ending up at the school for wizards and eventually he is discovered to instead be a sorcerer and begins the training for that instead and this is all alongside him being very much a revenge-driven character. While this path might seem at first to be a convoluted one, it was very enjoyable one as despite Azerick being a typical chosen one kind of a lead, he is an interesting and sympathetic character that drives the main part of the book forward very well and it was a slight disappointment when there was occasionally had an interlude that took the listener away from his story to learn a bit more about the world and politics of that region, even if such interludes are obviously necessary in the context of an ongoing series. The supporting cast were not as well-developed as Azerick, but that wasn't really needed with the focus being on him and there was certainly enough there to lay the foundations for a larger role if required in subsequent books. At first I didn't really enjoy the narration, it seemed to lack clarity to my ears, but things improved greatly as I progressed through the book and become more accustomed to his performance, the narrator gave a strong performance for Azerick overall and was suitably distinctive with the voices of the supporting cast. Overall, this book was both interesting and enjoyable in its own right, while at the same time nicely setting the stage for the series as whole. Would you listen to The Sorcerer's Ascension again? Why? What was one of the most memorable moments of The Sorcerer's Ascension? When Azerick goes to save his friends to prevent further loss. Which character – as performed by William Turbett – was your favourite? I received this book free of charge in exchange for a review.This book started out a bit slow but gradually increased in interest and adventure as the story proceeded. The story was an adventure from start to finish. The narrator was very good.The growth of Azerick from a spoiled child to a beginning sorcerer was well done. His involvement with people as he gained knowledge and experience was also good.This series has a lot of potential if it continues as this line. Book 1 of the sorcerers path introduces you to the main character Azerick, a character just imperfect enough to feel human. This book does not stand still, with the storyline and characters continuing to evolve and develop with surprising twists that will keep you enthralled. The emotional depths of the characters are very well displayed and of course, there's the whole magic thing. Who doesn't love magic! Definitely give this audiobook a try, I found it welcome distraction for long car journey's or even when sitting around at home. A great start to a great series! A great start to a spellbinding series, well read by William Turbett. I can't wait to hear subsequent volumes! The story is good but I felt the book spent too much time in his early life misery and the character makes simple mistakes to drag the story forward and I couldn't engage throughout most of the book but the ending gets a bit interesting. Will read book 2, hopefully, it gets better. After being really impressed by Brock’s Shrouds of Darkness, I was sadly disappointed in this book; more so as fantasy is my preferred genre. The book, although a good story which left me intrigued as to the rest of the trilogy, felt a little more YA than Shrouds, being filled with lots of coincidence and luck to fit the story together. It’s hard to know if the brattish smugness of the main character was down to the narrator or the author though. The narrator seems to pause in the wrong parts ‘if she’d have been born a woman... (leaving me time to think SHE IS A WOMAN!)... ‘she’d have been’ and so on, or saying something then pausing before finishing ‘said Azerick’. Everything also seems to be said with the same cadence and pace regardless of the intensity of the situation. Ultimately I’m glad I finished the book, although did consider stopping a few times, but I don’t think I’ll be downloading the rest of the trilogy. Don’t let this put you off giving it a go or getting the authors other books: as previously mentioned, Shrouds of Darkness was amazing!! This is a freely given unbiased review of a free review copy.